Bestow Your blessings here on me. Attend my circle and blessings bring! Who is the Goddess Demeter? Demeter Greek Goddess of the Bountiful Harvest and the Nurturing Spirit. 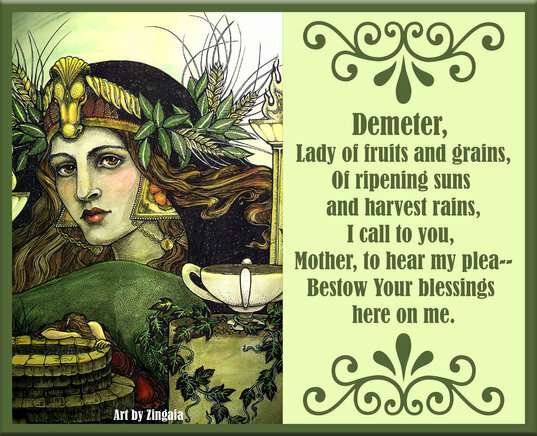 Demeter is both a Mother Goddess and an Earth Goddess. As the Mother Goddess she is a life-giver and source of nurturing, devotion, patience and unconditional love. As an Earth Goddess she brings life to the plants and crops in Spring, and teaches her people how to plant, harvest and use the grains. In Greek mythology the Goddess Demeter was beloved for her service to mankind in giving them the gift of the harvest, the reward for cultivation of the soil. As harvest Goddess she taught humans how to grow, preserve and prepare grain, and was also thought to be responsible for the fertility of the land. Demeter held a deep empathy for the suffering and grief of humans because she experienced it herself when her daughter Persephone was abducted by Hades and taken against her will to the underworld. Persephone was also known as the child Kore, her father was Zeus the ruler of the Olympians. When Persephone was kidnapped by Hades, Demeter heard her screams but couldn't find her. Demeter carried a torch and searched the world over for her beloved Persephone. While Demeter was searching she attracted the attention of Poisidon the Sea God who pursued her with lustful intent. Demeter changed herself into a horse amidst a herd or other horses to trick Poisidon into thinking that she had escaped. Unfortunately Poisidon wasn't fooled and he turned himself into a stallion and had his way with Demeter. As Demeter continued to search for Persephone, she encountered an impoverished old man who invited her to dinner at his home. Demeter refused saying that she must continue to search for her daughter, the old man said that he understood and wished her well and said that he understood her worry and unhappiness because he had a son at home who was dying. Demeter took pity on the old man and went with him to visit the son. Along the way she picked some poppies. When they arrived at the home of the old man and his dying son, Demeter kissed him on the cheek and restored his health with her love. Along the way she encountered Hecate, who advised her to speak with Helio, goddess of the sun who had been riding in her chariot (the sun) in the sky and may have seen what had happened to Persephone. Helio told Persephone that she had seen Hades abduct Persephone who was now Hade's wife and Queen of the Underworld. Helio also told Demeter that it was none other than Zeus, Persephone's father who gave Hades permission to abduct her. Demeter was extremely angry with Zeus and all of Mount Olympus, she swore that she would withdraw her Divine duties, the earth would become barren until Persephone was restored to her. Disguised as an old woman took refuge in the city of Eleusis where she met two young daughters at the well who invited her to return home with them. At the girls house was their mother who was holding her newest baby boy, seeing the mother loving her child created such longing and melancholy in Demeter that she became even more unhappy and refused to speak. The whole household tried everything to restore Demeter's happiness with no success until one of the household servants named Baubo sat with her joking and making lewd comments until finally Demeter smiled then laughed. Her good humor restored she was hired to be the nursemaid for the infant son. Demeter soon came to love the infant Demophoon and decided to make him immortal. One evening as Demeter was performing rites to make Demophoon immortal his mother came in and freaked out. Apparently part of the ritual for immortality involves holding the infant's feet over the fire and Demophoon's mother didn't understand that Demeter wasn't hurting the baby and she began to scream. This startled Demeter into dropping her "old woman" disguise and revealing her true Goddess beauty; she then berated the woman for stopping the ritual that would have made her son immortal. She demanded that a temple be built in her name and after it's completion she sat alone in her depression and grief for her lost daughter. The earth was still barren, no crops grew and an unending winter came upon the land. With the earth in perpetual winter Zeus soon began to see that he had made a grave mistake when he allowed Hades to abduct Persephone. Zeus apologized to Demeter and asked her to return to her duties and restore the land. Demeter refused until Persephone was restored to her. Zeus sent Hermes to command Hades to release Persephone. Persephone, upon hearing the news, rejoiced for she had missed her mother sorely. As she was leaving, Hades offered her a pomegranate to eat. Persephone had refused all food while she had been in the underworld, and was very hungry. Because Persephone knew that those who ate anything in the underworld were not allowed to return to earth she ate only the seeds. Hermes brought Persephone home to her mother at last and Demeter restored the fertility to the earth. Because Persephone had eaten the pomegranate seeds, she would have to return to the underworld for 4 months of each year. Each year Demeter misses her daughter and withdraws her favors from the earth for the 4 months that we call winter, but Persephone returns each spring bringing life, flowers and abundance to the land. Demeter was not pleased that Persephone had eaten the pomegranate seeds and would have to return to the underworld for four months during each year, but was otherwise overjoyed to be reunited with her daughter. Happily, Demeter resumed her divine duties and restored the fertility of the earth. Each year the goddess Demeter longs for her absent daughter and withdraws her favors from the earth for a period we know as winter, but Persephone returns each spring to end her desolation. Demeter decided to return to her Temple where she developed the Eleusian mysteries, a series of profound religious ceremonies that taught her initiates how to live joyfully and how to die without fear. Sacred rites were held at Eleusis in March and September to coincide with the sowing and the harvesting of the grain. Birth and Genealogy: Daughter of Cronus and Rhea and mother of Persephone. This Goddess had five siblings all of whom played important roles in Greek mythology, they included: Zeus, Poseidon, Hades, Hestia, and Hera. Sacred Animals: Pigs and snakes (her chariot was pulled by two winged serpents). 1 I begin to sing of Demeter, the holy goddess with the beautiful hair. seized. She was given away by Zeus, the loud-thunderer, the one who sees far and wide. 5 She [Persephone] was having a good time, along with the daughters of Okeanos, who wear theirgirdles slung low. by Gaia [Earth]. All according to the plans of Zeus. She [Gaia] was doing a favor for the one who receives many guests [Hadês]. to the immortal gods as well as mortal humans. to take hold of the pretty plaything. And the earth, full of roads leading every which way, opened up under her. calling upon her father [Zeus], the son of Kronos, the highest and the best. heard her voice. Not even the olive trees which bear their splendid harvest. Except for the daughter of Persaios, the one who keeps in mind the vigor of nature. 25 She heard it from her cave. She is Hekatê, with the splendid headband. And the Lord Helios [Sun] heard it too, the magnificent son of Hyperion. They heard the daughter calling upon her father, the son of Kronos. was seated far apart from the gods, inside a temple, the precinct of many prayers. He was receiving beautiful sacrificial rites from mortal humans. the son of Kronos, the one with many names. On the chariot drawn by immortal horses. her dear mother and that special group, the immortal gods. For that long a time her great noos was soothed by hope, distressed as she was. with her immortal voice. And the Lady Mother [Demeter] heard her. and threw a dark cloak over her shoulders. not one of the birds, messengers of the truth [etêtuma]. wander all over the earth, holding torches ablaze in her hands. 50 in her grief, nor did she bathe her skin in water. Hekatê came to her, holding a light ablaze in her hands. seized Persephone and brought grief to your philos thûmos? set out with her, holding torches ablaze in her hands. They came to Hêlios, the seeing-eye of gods and men. 65 I have pleased your heart and thûmos in word or deed. as if she were being forced, though I did not see it with my eyes. 75 “Daughter of Rhea with the beautiful hair, Queen Demeter! who gave her to Hadês as his beautiful wife. 80 seized her as he drove his chariot and as she screamed out loud. to have, of all the immortals, such a son-in-law as Hadês, the one who makes many sêmata. he has his share, going back to the very beginning, when the three-way division of inheritance was made. as they swiftly drew the speeding chariot, like long-winged birds. 90 And she [Demeter] was visited by grief [akhos] that was even more terrible than before: it makes you think of the Hound of Hadês. she shunned the company of gods and lofty Olympus. 95 looking at her, could recognize her. Not one of women, either, who are accustomed to wear their girdles low-slung. who was at that time ruler of Eleusis, fragrant with incense. at the well called Parthenion [the Virgin’s Place], where the people of the polis used to draw water. deprived of giving childbirth and of the gifts of Aphrodite, lover of garlands in the hair. and who are guardians of children in echoing palaces. in bronze water-jars to the phila home of their father. Kallidikê, Kleisidikê, and lovely Dêmô. 110 And then there was Kallithoê, who was the eldest of them all. They did not recognize her [Demeter]. Gods are hard for mortals to see. “Who are you, and where are you from, old woman, old among old humans? Why has your path taken you far away from the polis? Why have you not drawn near to the palace? since you ask, for me to tell you alêthea. Dôsô is my name. It was given to me by my honored mother. started preparing dinner next to the prow of the beached ship. But my thûmos did not yearn for food, that delight of the mind. from drawing any benefit from my worth without having paid the price. what this land is and who live here. in accordance with the wishes of your parents. As for me, young girls, take pity. To be honest about it, what I want is for you to name for me a house to go to, the house of someone, man or woman, who has phila children to be taken care of. 140 honestly. The kind of work that is cut out for a female who has outlived others her own age. and nourish him well. I could watch over his house. “Old Mother, we humans endure the gifts the gods give us, even when we are grieving over what has to be. They [the gods] are, after all, far better than we are. with their wise counsel and their straight dikai. 155 of Dolikhos, and of our splendid father [Keleos]. The wives of all of these manage the palace. would deprive you of tîmê, the way you look, and turn you away from the palace. Rather, they will receive you. For, right now, you look like the gods. to come to our house and not to seek out the houses of others. She has a treasured son, growing up in the well-built palace. 165 He was born late, after many a prayer for the birth of a son: a great joy to his parents. I can predict that you will be the envy of any woman who lays eyes on you. 170 filling their splendid jars with water, carried it off, looking magnificent. over their shoulders, looking like crocus blossoms. 180 they had left her. Then they led her to the phila palace of their father. She was walking behind them, sad in her philon heart. trailed around the delicate feet of the goddess. Straightaway they came to the palace of sky-nurtured Keleos. reached all the way to the ceiling. And she filled the whole indoors with a divine light. 190 She [Metaneira] was seized by a sense of aidôs, by a holy wonder, by a blanching fear. She [Metaneira] yielded to her [Demeter] the chair on which she was sitting, and she told her to sit down. a well-built stool, on top of which she threw a splendid fleece. On this she [Demeter] sat down, holding with her hands a veil before her face. For a long time she sat on the stool, without uttering a sound, in her sadness. And she made no approach, either by word or by gesture, to anyone. until Iambê, the one who knows what is dear and what is not, started making fun. making her smile and laugh and have a merry thûmos. 205 Ever since, she [Iambê] has been pleasing her [Demeter] with the sacred rites. Then Metaneira offered her [Demeter] a cup, having filled it with honey-sweet wine. with delicate pennyroyal, and to give her [Demeter] that potion to drink. 210 So she [Metaneira] made the kukeôn and offered it to the goddess, just as she had ordered. The Lady known far and wide as Dêô accepted it, for the sake of the hosia. 215 and the look of kharis, just as if you were descended from kings, who uphold the themistes. We humans endure the gifts the gods give us, even when we are grieving over what has to be. The yoke has been placed on our neck. But now that you have come here, there will be as many things that they give to you as they give to me. 220 that the immortals could have given him to me. I prayed many times to have him. 225 “Woman, I wish you kharis back, and then some. May the gods give you good things. With positive intentions, I will take your little boy as you tell me to. he would perish from a pestilence or from the Undercutter. and she would breathe down her sweet breath on him as she held him to her bosom. at how full in bloom he came to be, and to look at him was like looking at the gods. afraid for her child. She had made a big mistake in her thûmos. “My child! Demophon! The stranger, this woman, is making you disappear in a mass of flames! 250 So she spoke, weeping. And the resplendent goddess heard her. —she took him in her immortal hands and put him down on the floor, away from her. But now there is no way for him to avoid death and doom. on my knees and slept in my arms. among each other. They will do so for all days to come. boon and joy for immortals and mortals alike. be built by the entire dêmos. Make it at the foot of the acropolis and its steep walls. Make it loom over the well of Kallikhoron, on a prominent hill. shedding her old age, and she was totally enveloped in beauty. And a lovely fragrance wafted from her perfumed robes. shone forth from the goddess. Her blond hair streamed down her shoulder. 280 The well-built palace was filled with light, as if from a flash of lightning. She went out of the palace, and straightaway her [Metaneira’s] knees buckled. her treasured little boy, to pick him up from the floor. picked up the child in her arms, clasping him to her bosom. to prop up her mother as she was staggering out of the fragrant room. They all bunched around the little boy, washing him as he gasped and spluttered. 290 They all kept hugging him, but his thûmos could not be comforted. He was now being held by nursemaids who were far inferior. 295 and what the goddess Demeter, the one with the beautiful garlands in the hair, instructed them to do. 300 They built it as he ordered. And the temple grew bigger and bigger, taking shape through the dispensation of the daimôn. 305 She made that year the most terrible one for mortals, all over the Earth, the nurturer of many. any seed. Demeter, she with the beautiful garlands in her hair, kept them [the seeds] covered underground..
315 Demeter with the splendid hair, with a beauty that is much loved. 325 After that, the Father sent out all the other blessed and immortal gods. 330 angry as she was in her thûmos, and she harshly said no to their words. see her with her own eyes and then let go of her anger. rushing full speed, leaving behind the abode of Olympus. 345 inflicted on her by the will of the blessed ones. “Hadês! Dark-haired one! King of the dead! with his brows, and he did not disobey the order of Zeus the King. Swiftly he gave an order to bright-minded Persephone. over there, at the side of her honorable mother, the one with the dark robe. by Hadês, the one who makes many sêmata. and shot out of the palace [of Hadês]. And the horses sped away eagerly. nor the mountain peaks could hold up the onrush of the immortal horses. High over the peaks they went, slicing through the vast air. she rushed forth like a maenad down a wooded mountainslope. once again, a great thing of wonder to gods and mortal humans alike. and he compelled me by biâ to eat of it. I will tell you and relate in order, as you ask. Styx, Ourania, and lovely Galaxaura. Also Pallas [Athena], the one who rouses to battle, and Artemis, who delights in arrows. and the narcissus, which is grown, like the crocus, by the wide earth. 430 gave way, and there it was that he sprang out, the powerful lord who receives many guests. He took me away under the earth in his golden chariot. It was very much against my will. I cried with a piercing voice. hugging each other, and their thûmos ceased having akhos. They received joy from each other, and gave it. Then Hekatê approached them, the one with the splendid headband. And she welcomed back the daughter of holy Demeter with many embraces. 440 And from that day forward, the Lady [Hekatê] became her [Persephone’s] attendant and substitute queen. that he would give to her [Demeter], which she could receive in the company of the immortal gods. and the other two thirds in the company of her mother and the other immortals. So he spoke, and the goddess [Rhea] did not disobey the messages of Zeus. began to be overflow with cut-down ears of grain lying on the ground, while the rest of what was cut down was already bound into sheaves. This happened the moment she [Rhea] arrived from the boundless aether. They [Demeter and Rhea] were glad to see each other, and they rejoiced in their thûmos. that he would give you, which you could receive in the company of the immortal gods. 465 and the other two thirds in your company and that of the other immortals. He has assented to all this with the nod of his head. stubborn in your anger at the dark-clouded son of Kronos. 470 So she spoke, and Demeter, she with the beautiful garlands in her hair, did not disobey. Straightaway she sent up the harvest from the land with its rich clods of earth. 480 Olbios among earth-bound mortals is he who has seen these things. they [Demeter and Persephone] went to Olympus, to join the company of the other gods. 485 And there they abide at the side of Zeus, who delights in the thunderbolt. being kind, decide to love among earth-bound mortals. Ploutos [Wealth personified], who gives riches to mortal humans. 490 But come, you goddesses, who have charge of the dêmos of Eleusis, fragrant with incense. and of Paros the island and rocky Antron. both you and your daughter, the most beautiful Persephone. Think kindly and grant, in return for this song, a rich means of livelihood that suits the thûmos. 495 And I will keep you in mind throughout the rest of my song.